(Nanowerk News) Researchers at the University of Illinois at Chicago and Queensland University of Technology of Australia, have developed a device that can isolate individual cancer cells from patient blood samples. The microfluidic device works by separating the various cell types found in blood by their size. The device may one day enable rapid, cheap liquid biopsies to help detect cancer and develop targeted treatment plans. The findings are reported in the journal Microsystems & Nanoengineering ("Isolation of circulating tumor cells in non-small-cell-lung-cancer patients using a multi-flow microfluidic channel"). "This new microfluidics chip lets us separate cancer cells from whole blood or minimally-diluted blood," said Ian Papautsky, the Richard and Loan Hill Professor of Bioengineering in the UIC College of Engineering and corresponding author on the paper. "While devices for detecting cancer cells circulating in the blood are becoming available, most are relatively expensive and are out of reach of many research labs or hospitals. Our device is cheap, and doesn't require much specimen preparation or dilution, making it fast and easy to use." However, isolating circulating tumor cells from the blood is no easy task, since they are present in extremely small quantities. For many cancers, circulating cells are present at levels close to one per 1 billion blood cells. "A 7.5-milliliter tube of blood, which is a typical volume for a blood draw, might have ten cancer cells and 35-40 billion blood cells," said Papautsky. "So we are really looking for a needle in a haystack." Papautsky and his colleagues developed a device that uses size to separate tumor cells from blood. "Using size differences to separate cell types within a fluid is much easier than affinity separation which uses 'sticky' tags that capture the right cell type as it goes by," said Papautsky. "Affinity separation also requires a lot of advanced purification work which size separation techniques don't need." The device Papautsky and his colleagues developed capitalizes on the phenomena of inertial migration and shear-induced diffusion to separate cancer cells from blood as it passes through 'microchannels' formed in plastic. "We are still investigating the physics behind these phenomena and their interplay in the device, but it separates cells based on tiny differences in size which dictate the cell's attraction to various locations within a column of liquid as it moves." Papautsky and his colleagues 'spiked' 5-milliliter samples of healthy blood with 10 small-cell-lung cancer cells and then ran the blood through their device. They were able to recover 93 percent of the cancer cells using the microfluidic device. 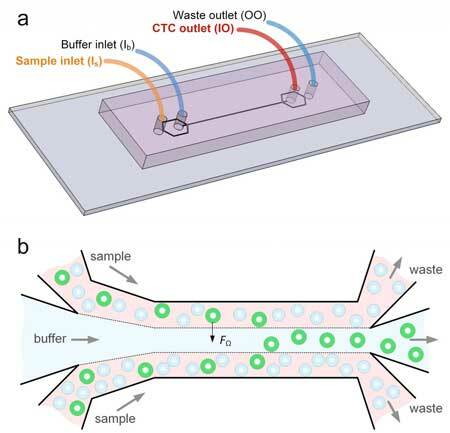 Previously-developed microfluidics devices designed to separate circulating tumor cells from blood had recovery rates between 50 percent and 80 percent. In addition to the high efficiency and reliability of the devices, Papautsky said the fact that little dilution is needed is another plus. "Without having to dilute, the time to run samples is shorter and so is preparation time." They used whole blood in their experiments as well as blood diluted just three times, which is low compared to other protocols for cell separation using devices based on inertial migration.